Two weekends ago we installed the chimney and wood stove, and fired up the wood stove. Not a moment too soon as it was FREEZING that weekend - both wet and cold. 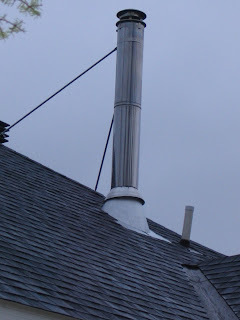 Fortunately, we got a break in the rainy weather long enough to install all the exterior elements of the chimney. In most jurisdictions the chimney must be at least two feet higher than any part of the roof within 10 feet (Horizontally). If the chimney is going to be over 4 feet high secure it with braces. The brace needs to be at least 2/3 the way up the chimney. Make sure you install the roof flashing and caulk it properly, install the storm collar and have a chimney cap. Be sure your chimney cap has a spark arresting screen. Above all be sure to be safe when installing. We used a safety harness for everyone who was up on the roof. Be sure to secure the roof for the harness both on the opposing side of the roof to a solid structure that can hold a multiple of the weight of the user AND that the rope is secure from rolling off the roof.